Spoilers. Sorry. 😦 It’s hard to discuss a book well without spoilers. Despite the very modern look of this cover, this novella is one of the first vampire books, predating Bram Stoker’s Dracula by 26 years. It was a serial story published in the magazine The Dark Blue from 1871 to 1872. Carmilla is narrated by a sweet, lonely girl named Laura, who is stuck with her father in a castle far from any company. She is eagerly expecting the arrival of a new friend, ward of her father’s friend General Spielsdor. Just before their expected arrival, a letter informs Laura and her father that the girl has died suddenly, and the General is on a quest to discover the murderer. Almost immediately upon reading this letter, there is a carriage accident involving a lady and her young, amazingly beautiful, daughter. The mother says that she must move on immediately, but the child is sick so she’ll have to leave her in the next town. Laura’s father insists that they keep the child as a ward – she will make a fine friend for Laura. Sure enough, Laura and Carmilla become tight friends – in fact, creepily tight. Carmilla is almost homosexual in her adoration of Laura. It would be easy to discount such female-love because in the era in which this book was written lesbianism wasn’t really considered an open possibility. I could easily shrug it off as intimacy which was acceptable at the time the book was written. But even Laura is a little creeped out by Carmilla’s love for her. Soon, lower-class girls in the neighborhood start dying of a strange wasting disease. Meanwhile, Carmilla mysteriously locks herself in her room at night, and doesn’t descend until afternoon. Laura is haunted by terrifying dreams of monsters at night, and begins to waste away herself. Just in the nick of time, General Spielsdor arrives, telling a strange story of a young, strikingly beautiful, girl who was left in Spielsdor’s care after the mysterious mother needed to leave town suddenly. Spielsdor was convinced that the child was a vampire and had murdered his sweet ward, and then had left town after he’d tried to impale her with his sword. The similarities in the stories were discovered, and Carmilla was henceforth dispatched. I think the parallels between this story and Bram Stoker’s Dracula are quite striking. They both have a vampire hunter tracing the movements of the abomination. Both vampires sneak in at night and attack the victim several times before death occurs. Carmilla turned into a large cat instead of a dog, as in Dracula, but both vampires slept in coffins. On the other hand, it’s been a while since I’ve read Dracula, but I’m pretty certain he was unable to withstand sunlight, whereas Carmilla moved freely throughout the day. The parallels are likely due to use of the same primary sources of Slavic vampire folklore. I enjoyed this book a lot. The narration moved along quite nicely, and the book was short and to-the-point. I would recommend it to anyone who find vampire folklore to be interesting. Le Fanu, J Sheridan. 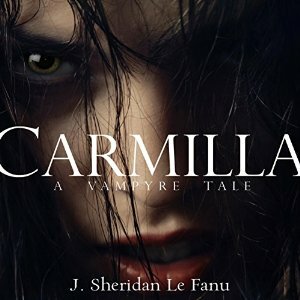 (2010) Carmilla: A Vampyre Tale [BBC Audio Version. Follows, Megan (na).] Retrieved from audible.com. I went and downloaded this book from project Gutenberg. I can't wait to read it. I think that I had heard something about it before but I never knew much about it. It sounds as if Bram Stoker borrowed a lot from it. Thanks for pointing out how the book could simply have nothing to do with lesbianism. Yeah, I read a review of this book on another blog and immediately went to Audible and downloaded it. (I don't have a lot of time for “real” books right now and am trying to keep on track for my TBR.) I hope you enjoy it! I'd never heard of this book before I read a review about it very recently. But as soon as I heard about it I simply had to read it. It's a pretty short book and you can get it from Gutenberg Press, you should try it out. The reading by Megan Follows of this is so, so good.